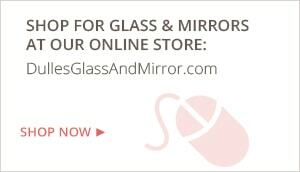 Dulles Glass will help you get the perfect custom fireplace mirror today! Lead and copper free for superior clarity. Quotes are free – just send us your measurements for a fast and easy quote! A fireplace is often the focal point of the room it is in. Get the perfect look with a custom cut mirror, and stop wasting time looking for the perfect size and shape. We have the best custom features in the industry. Install a frameless fireplace mirror directly to the wall above your fireplace. This creates a sleek, modern look. Get the perfect-sized mirror cut just to fit your fireplace, and don't settle for standard sizes that just don't look right. Then you can customize with your own choice of DIY frames for the perfect personal touch. Dulles Glass fireplace mirrors are made of 1/4" thick glass and all have a safety backing that helps prevent messy and dangerous accidents. Our mirror installation specialists can affix the mirror directly to the wall using a mirror mastic, or glue, for maximum safety. We'll cap this off with J-bars or L-bars, which are used to support the mirror at the top or bottom, along with your choice of decorative clips, standoffs, or rosettes if you prefer. Limit one per customer. Valid on "short-of-wall" installation only. Not to be combined with any other offers. Washington, DC metropolitan area only.